Editor’s note: This article is part of an ongoing series covering classical music and Iberian wine pairings by Burt Frink. To understand its origins, and why Burt felt a series was required on the subject, please read his first piece. His second piece covered classical and chamber music, while his third covers pairings for male vocal recitals. I love the silence I share with myself and a glass of wine. Often, but certainly not always, I bring music into the experience. Invariably it is classical music Why? It fits. I find the Piano concerto to be the friendliest of the classical genres. I wouldn’t be surprised if it is what most non classical listeners associate with the concept of the classical repertoire. I may be wrong but nothing quite like it exists in other musical styles. A piano player performs a showcase of remarkable techniques lasting nearly three quarters of an hour in front of upwards of a hundred orchestral musicians doing what can only politely be described as showing off. We will begin with Liszt because the flamboyant extravaganza that we expect from the piano concerto began with Franz Liszt. Before that fiddle players like Paganini made the big bucks (as did castrati like Farinelli) because the audience came out then as now for flash and trash. In the mosh pit of the 1800s beautifully dressed men and women kept their seats but they wanted something special in the way of performance. Flamboyant violinist Paganini gave it to them and Franz Liszt wanted in on the income. So he composed his own ostentatious keyboard display pieces to enthrall audiences and keep them spellbound. His tradition extends to today with a powerful performance style even in the youngest artists. Take in a recital by Lang Lang who I have been known to call Bang Bang and you will see what I mean. I’ve heard him in concert twice and both were authoritative evenings but call me cruel; I wasn’t moved. Let us start with the commanding Argentine lady who I have heard described as breaking pianos rather than playing them. Since her introduction to world audiences as a young prodigy at the age of eight Argerich has been a keeper of the flame for the powerful and flamboyant style of concertizing. A performer who has given few interviews in her lifetime a rare glimpse of her is available on film in the recently released documentary Evening Talks. As she is very articulate regarding music it would seem she just doesn’t want to talk often. To me the provoking question is if audio/music critic John Sunier is correct in his declaration on the notes for her Tokyo concert DVD that Argerich is the finest female classical pianist and perhaps the finest living pianist period? It could be. An evening with one of her many recordings and a glass of wine is guarantee of a rich time for me. She is nearly everything musical that I am looking for in a companion to a thoughtful glass of contemplation. The wine for me is a Malbec. This is the great achievement of her home country. Like the piano concerto it is a huge, dense, and demanding experience. In the music and the wine I look not for the obvious notions but rather the illusive subtleties; the light and shade the keeps both from being just a ham-handed pounding. Iberian Pairing: Go with the reds of Montsant. Despite its unique position encompassing the famed region of Priorat – famous for its knock-out gigantic reds – Montsant delivers equal quality with the added bonus of fresh, vivacious acidity. Since the passing of Alicia de Larrocha in the autumn of 2009 at the age of 86 Ms. Pires seems the apparent inheritor of her crown as the Grande Dame of Iberian pianists. This eminent Portuguese instrumentalist is celebrated as one of the greatest living interpreters of Mozart. A refined woman and sophisticated artiste she searches to discover the detail and interpretive clues in a highly personal and emotional manner. This is not a Mozartian bean counter. Here is a master class of hers that will give you a taste of her passionate investigative approach. A successful concerto performance does exactly what she addresses: it helps me to feel something. The soloist should musically pressure for private involvement. This is much of what goes wrong in the social wine setting. There is always the affectation of style to use Ms Pires word. A preening and personal self importance to go with the litany of descriptors and the invariable quantoid quotes from the wine press with the attendant numbers or stars. I can’t seriously taste that way. At lest not with any real individual importance. RP 91 means nothing to me. This is posture and talk that more often than not intrudes on my experience. Alone with the Mozart I would chose from the list of Sarah Ahmeds 50 Great Portuguese Wines. Will it be white or red? It’s Mozart and you can argue both ways. You can also choose to be light and frivolous or deep and serious. Yefim Bronfman looks less like the person who is going to play the piano than like the guy who should be moving it. I had never before seen anybody go at a piano like this sturdy little barrel of an unshaven Russian Jew. When he’s finished, I thought, they’ll have to throw the thing out. I have seen Bronfman in recital on two occasions and look forward to doing so again in about a week’s time. The experience of enjoying music of this caliber coming out of a man who in no way visually suggests his inner being is gratifying. This popular concerto began its life with a pairing of superstars. Rachmaninoff himself performed the dazzling piano part he had written at his summer estate in Russia and practiced on the long voyage to America aboard ship on a dumb piano which allowed him to perfect the part silently. On the podium it was no less than Gustav Mahler who took over conducting from the original maestro Walter Damrosch in New York City. It is a composition of enormous variety and penetrating mood. Cote Rotie is my bottle of choice. These Syrahs from the Northern Rhone are dramatic wines that fit well in my hand with this equally dramatic music. Iberian Pairing: If you’re interested in staying in the Syrah scene to keep with Burt’s sense of drama and emotion, go with wines of Toro. These Syrah’s show equal elegance with amazing power. Here is a different creature altogether. Make no mistake about Ms Grimaud’s power. In her Brahm’s recordings from her teenage career we see and hear a powerful technique in a little girl at her pigtail stage of life. She was a bit of a tomboy and tough as any other kid at the keyboard. But she has grown up. And now she is one of the most ravishingly beautiful instrumentalists on the concert stage. So much so that she seems to deliberately dress down her wardrobe and grooming to avoid the obvious criticism that the audience is only drawn by her beauty. Like the Russian soprano Anna Netrebko she is every bit an artist in spite of the gorgeousness. Both women are loved by the camera. This delicate passage we sample communicates the quieter colors that come in the concerto form. The still and thoughtful mood of this work which is unique for not focusing on pianistic acrobatics is a more poetic sample of the genre. More artistry and less virtuosity make it a real choice. For the wine if I can find it I want a rare bottle from Franconia; the German district that is home to Beyreuth Festival dedicated to the operas of Wagner. It is dry, mineral Sylvaner. It is sold in bocksbeutel; that oddly easily recognizable silhouette suggesting a goats nether regions. Its profile makes it distinctive on the shelf but clumsy to ship and to stock. That may be why it is so seldom seen or perhaps it is as simple as the local people consume what is produced as is the case with many interesting wines. It is the crystalline purity and mineral deliciousness that makes it my choice for this beautiful woman playing beautiful music. Iberian Pairing: If we’re seeking out drop dead gorgeous white wines, then look no further than Castille y Leon. Despite its rather conspicuous location in the middle of Spain, making the layman readily cry “that’s a red region my friend”, smile and walk away with some stunning whites that sing of dashing beauty. I come back to Lang Lang because he is one of the most distinctive pianists of our time and if he lives a life as long as Vladimir Horowitz it is unimaginable what he may accomplish. The Mendelssohn composition that immediately jumps to mind at the mention of the composers name is his renowned violin concerto indispensable to the repertoire of every concertizing soloist. His piano concerto is distant in familiarity but is a marvelous piece of music. This is truly a showpiece; a dazzler in every sense making huge demands on both the pianist and the piano. Seldom are we able to be close enough to see the muscularity behind a seemingly flawless keyboard technique. This is physical music making. Also we see the punishment the instrument itself, be it Steinway or Bosendorfer or comparable standard of piano, need be able to endure in concert, recital, or recording session. These are hard-hitting musicians with sturdy tools. You rarely get to see it up close as they both wear black and look so polite from your auditorium seat. It takes strength to produce the sound. For some it’s the whole body, others it’s the lower arm. For all there is utter force of hands and fingers to perform this repertoire at a world class standard. Some pianists can dazzle us without engaging us. But look at Lang Lang on this occasion. See the freedom of the man and the visible joy. This playing is not restricted and systematic but open and liberated. He plays from his heart to our heart. It is the summation of the pleasure of the piano concerto. For the wine it seems to me that when a musician this young attacks music this old it is a great opportunity for a bottle of new world grapes blending with old world traditions. The Super-Tuscans of Italy provides a certain model but better yet one of Spain or Portugal’s old world/new world blends. The challenge to the tradition in the music and the glass draws me into a different mind set. It is a place where I acknowledge what has always been and join it with the notion of why not? Classical music stays alive by a rich continuum of challenge that can be dizzying at times. Wine also feels little need to stand still. The keyboard concerto repertoire is rather agreed upon and contained and seldom added to. You’ll squeak in a Corigliano or a occasional newly commissioned work. But it’s the three B’s , two two M’s along with a few others that are programmed year after year throughout the world. And young students learn this catalog by necessity and this brings new faces and fingers to the concert stage and recording studio. This is not a complaint or a carp. The fact is we love this music just as we love the wines we return to over and over again. Both touch something that exists inside of us and it is only in the quiet of our own companionship that we can be trusted to focus on our personal experience. My feelings are that familiarity doesn’t remotely touch the why of my return. I am looking to the experience of wine that isn’t obvious. It’s ability to take me within myself. It’s ability to awaken or connect the inner experience. I seek the same with this music. With the concerto I know it is fast which means the performer must be precise. I know there is a wide dynamic range. Spare me the obvious. Touch me. Awaken what lies within. Create a rise in emotion. That’s why I listen to music. That why I’m drinking wine. And that’s why I don’t want to talk to others; this is my sanctuary. I don’t want distraction from the dialogue with my self. 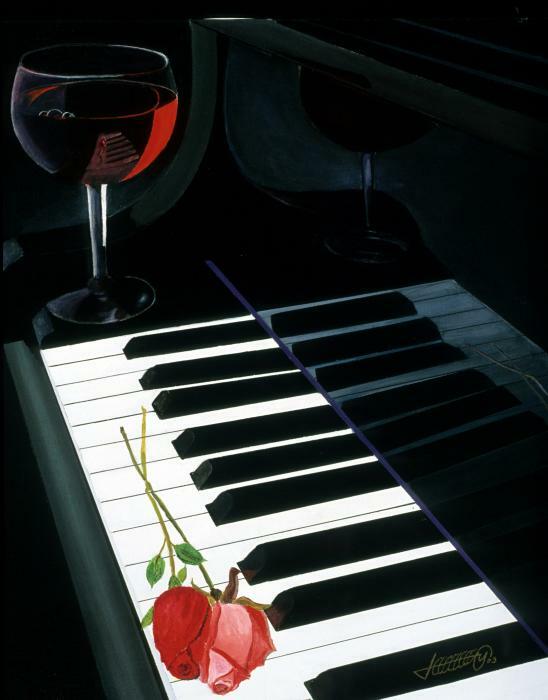 Next time we will look further into music, wine and that inner life. I will urge you to consider that within this abrasive world there is need for healing; my music, my wine, my healing.